My name is Shannon and I am a SAHM to 3 children and a host of critters. I am a former veterinary technician and obedience instructor. I love to write and compete with my dogs. My dog’s name is Rama. She turned 15 months old on the 23rd of this month. 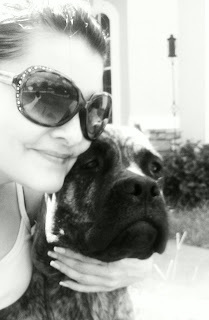 She is a Cane Corso (pronounced kah-nay kor-soh). I have coffee with Rama every day here at home, after the older kids have gone to school and we have done our walk. We also frequent a local café on Saturday mornings after dog obedience class. Every morning and evening I have a large coffee from McDonald’s, one cream and eight Splendas. 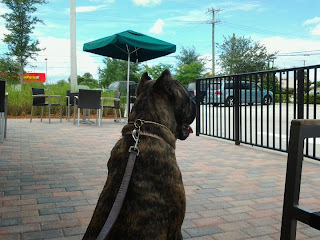 When we go out—usually after dog class on Saturdays-- it’s a Peppermint Mocha Latte with soy milk and no whipped cream. Any treats for you or Rama on this occasion? I usually have an omelette. By this time Rama has consumed a bunch of liver treats in class and shows no interest in what is on the table. How did Rama get her name? One day while watching my favorite soap opera, they introduced a beautiful character named Rama. I am also very interested in Hindu dieties and art. Rama is an incarnation of Vishnu—a Hindu diety celebrated for his unending compassion and courage. I immediately said to myself that my first Corso would be named Rama. Rama Mama, Rama Llama, Rama Llama Ding Dong, Pup-Pup, Puppy. 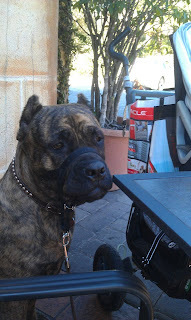 Please tell us a bit more about the Cane Corso breed and what attracted you to it. The Cane Corso (also called Italian Mastiff) is descended from the Roman war dog canis pugnax. They are a leaner, more athletic dog than other mastiffs and can have either natural ears and tail or cropped. They were just accepted into the AKC last year and came to this country from Italy in the late 80’s. I love molossers. I had Rottweilers for several years and am attracted to large, powerful guarding and working breeds. I am quite stubborn myself; I have been told that I attract dogs with the same qualities. I was attracted to the Corso’s reputation as a loving family dog and low key house dog. How were you and Rama united? I had been looking at a few different breeders for a show pup and found one whose dogs I liked. She happened to be near me so I went out to her place a few times to look at her dogs. About a week later she emailed me some photos of an older pup she had. Apparently a gentleman out of state had put a deposit on Rama and never showed to pick her up. She offered her to me. I took the kids back out to her place to visit with Rama. She was about 5 ½ months old, gentle, sweet and happy, immediately playing fetch with my middle child. She did not jump on the children and was very well behaved, not to mention beautiful. Her face reminded me of my very first Rottweiler in that there was a lot behind the eyes. I was sold. She went home with us that day. Does Rama have a favorite place to go for an outing? She loves to walk around our neighborhood. We do about 3.5 miles every day. She also enjoys going to the beach. Nope. She is a very non-reactive dog. She is not overly barky and shows no interest in chasing squirrels or cats or anything, really. She does like sticks, legos (much to my chagrin) and squeaky toys. What is Rama's best quality? Who is Rama's closest pet-pal? Sadly, my other dogs (they are little) will not play with her so her closest pet-pal would probably be her litter sister Lily, whom she sees at shows and when we go to visit her breeder. She loves to play with her. If Rama could change one thing about you, what would it be? She would prefer I pet her constantly. If Hollywood made a movie about your life in which Rama could speak, which actor should do her voice? I envision her with the voice of a small child. Sort of like those Subway commercials where the adults have little kid voices. 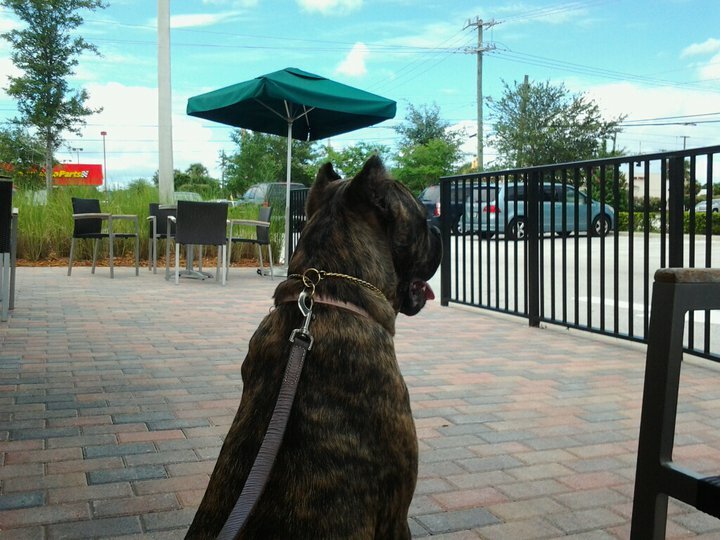 Visit the Raising Rama blog and learn more about the Cane Corso breed. Thanks for the info on the Cane Corso. It's always so interesting to learn about different breeds. Rama is beautiful! Thanks for sharing her with us! yay! we love Rama's blog!